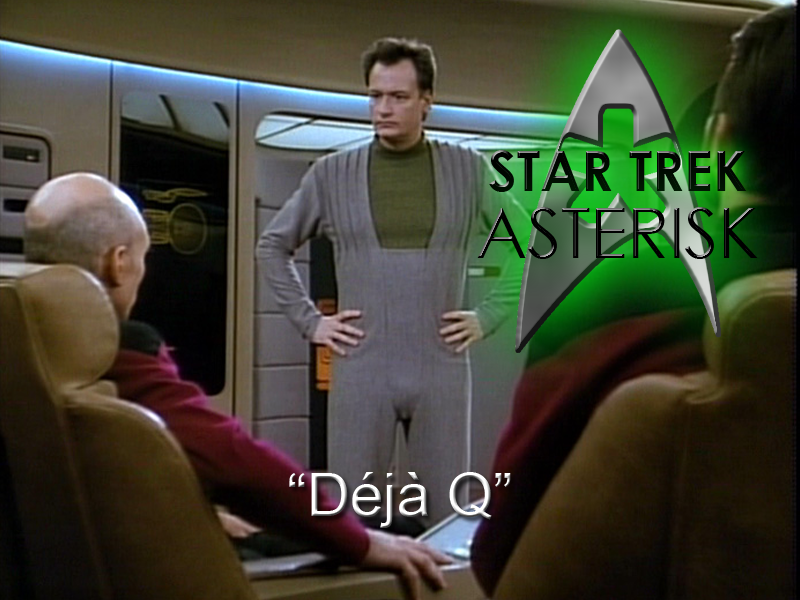 Star Trek: Asterisk "Déjà Q"
Q becomes human and orders TEN CHOCOLATE SUNDAES. So, the Enterprise's mission this time is to go to Bre'el IV and move its moon because the moon is about to crash into the planet and kill all its civilization. They get right to the daunting task, but in the middle of figuring things out, they hear a high pitched noise and a bright light and after a few seconds of this, Q appears in all his naked glory floating over the floor of the bridge. "Red Alert!" he says saucily as he looks up from the ground. Apparently, the Q Continuum has punished him for being such a jerk and he chose as his punishment to be made a mortal human. That's his story and he's sticking to it. Of course Picard and the crew don't believe him, so, after changing into an earthy green and grey onesie, he's immediately escorted by Worf to the brig during which time he tries to get on the security officer's good side by saying he should have chosen Klingon. Meanwhile, Picard and Riker discuss the possibility that Q is the one behind the decaying orbit of the Bre'el IV moon. 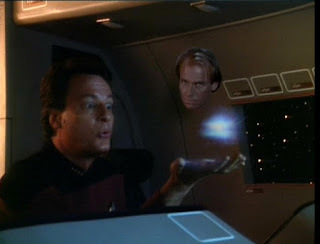 But, Picard points out, there's always the possibility that he's telling the truth and has nothing to do with the moon. 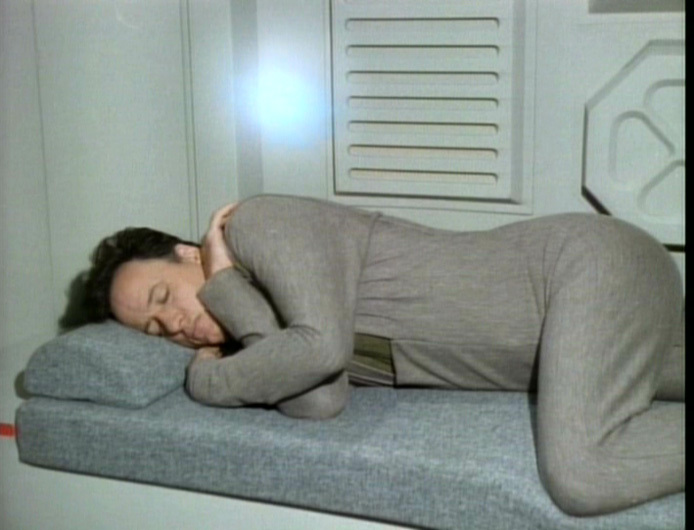 And that's when a hazy white energy fills the Enterprise and then focuses into a ball that hovers over Q who is sleeping in the brig... and then disappears. After that, Picard decides to get serious about what Q's doing here and goes down to the brig. There, Q convinces Picard to give him a chance, so Picard sends him to Engineering, where he could be the most help. Except he's not. He has all the knowledge of the Q, but no means by which to use that knowledge. He suggests changing the gravitational constant of the universe in order to deal with the moon, and after Geordi says they can't do that, Q begins to suffer from back pains. Beverly arrives to fix that, but he soon also encounters stomach pain. Beverly's diagnosis: he's hungry. Giving him a case of Saturday Night Fever! Sensing the energy from the bridge, they compensate the shields and successfully repel the white energy, but Q still has some explaining to do. 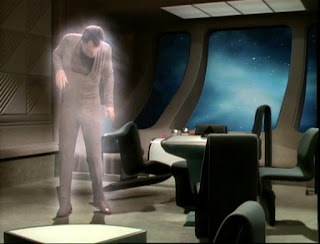 So he tells Picard in a conference that the white energy is the Calamarain, with whom he had had dealings in the past. That's when it all comes together for Picard. Q came to the Enterprise for protection against the many races he had wronged. Well, that's not the job that Riker signed up for, so Picard vows to drop him off at the next starbase. Well, now they really have to deal with this moon situation, so, with Q's begrudging help in Engineering, they enact Geordi's plan. It almost seems to work, but then the Calamarain take advantage of the power drain from the shields and attack Q once again. Geordi can't give more power to the shields or he'll risk blowing up the ship from the strain of moving the moon. 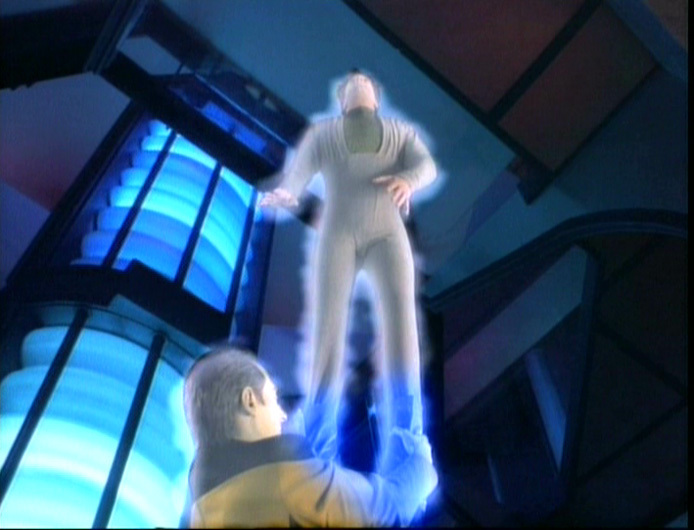 So the Calamarain lift Q up to the ceiling, and Data grabs onto his foot, exposing himself to the same white energy. Just about as fun as a barrel of monkeys. Except for another Q. Q2 comes along with his long blond hair and addresses Q. It seems there was a small matter of Q performing a selfless act. He knew that the Calamarain would destroy the Enterprise in order to get to him, so by taking the Enterprise out of danger, he inadvertently proved to the Continuum that he was actually a good guy. So Q2 is obligated to give Q his powers back. As soon as he gets his powers back, Q changes into a red Starfleet uniform and then lightly torments the Calamarain. Q2 glares at him, though, so he just sends the Calamarain away. The only context under which this frame makes sense. It's time to celebrate! Q brings a mariachi band on the bridge of the Enterprise and hands out cigars to everyone. Huzzah! I'm immortal again! Picard is not amused. 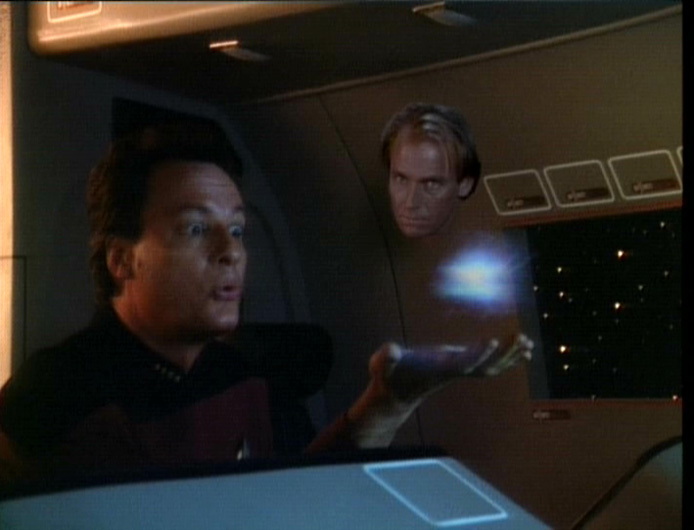 He tries to get Q to leave, but Q continues celebrating by giving Riker some fantasy women which he denies needing. But Picard has had enough, so Q promises to leave after he gives Data a gift. 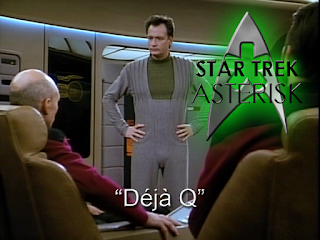 Data doesn't want to be made human, but Q assures him he would never curse him with something like that. Instead, he makes Data laugh. After a long and hardy laugh, Geordi asks Data what's so funny and he admits he doesn't know, but was a wonderful feeling. In the meantime, the Bre'el people call to thank Picard for putting the moon back in orbit, however he did it. Obviously, this wasn't the work of Picard... but of Q. And they lived happily ever after and learned a valuable lesson about wasting sundaes. I love a good Q episode, but the real charm in this one comes from the insult comedy. People marginalizing Q left and right and him firing back easily; it's beautiful. The poignant message of this episode, however, seems to be that being human is nothing trivial. Androids aspire to it, and immortals look down on it with disdain, but when any being is faced with mortality, that's when their true colors shine through.